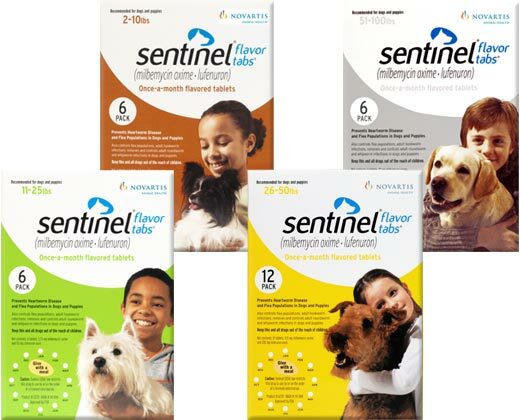 Sentinel Flavor Tabs are the only monthly oral preventive that guards against heartworms and fleas as well as adult roundworms, adult hookworms and whipworms. Sentinel Flavor Tabs are the only monthly oral preventive that guards against heartworms and fleas as well as adult roundworms, adult hookworms and whipworms. Sentinel does not kill adult fleas. Customers purchase Capstar, sold separately, for a complete flea control program. Possible Side Effects Side effects are rare at the recommended heartworm prevention dosage. May see depression, lethargy, vomiting, staggering, loss of appetite, diarrhea, seizures, weakness, or excessive salivation. If you observe any of these signs, contact your veterinarian. If your pet experiences an allergic reaction to the medication or the dying of parasites, signs may include facial swelling, hives, scratching, sudden onset of diarrhea, vomiting, shock, seizures, pale gums, cold limbs, or coma. If you observe any of these signs, contact your veterinarian immediately. Precautions Not for use in animals who are hypersensitive (allergic) to it. Consult your veterinarian regarding heartworm testing your pet prior to, and during, treatment with this medication. Not for use in Collies or other herding breeds over the recommended heartworm prevention dose unless under the strict supervision of a veterinarian. (Doses larger than those for heartworm prevention are used to treat mange.) If your dog is one of these breeds and is receiving a higher dose, observe your pet for at least 8 hours after giving the medication for weakness, staggering, fever, dilated pupils, trembling, or pressing the head against a wall. Contact your veterinarian immediately if you see these signs. Do not use in puppies less than 4 weeks of age or less than 2 pounds, or in kittens less than 6 weeks of age or less than 1.5 pounds. Considered to be safe to use in pregnant and lactating animals (female animals nursing their young). Consult your veterinarian regarding physical examinations and heartworm testing your pet prior to, and during, treatment with milbemycin oxime. Properly dispose of unused milbemycin, as it may be toxic to fish and other animals. Human Precautions Some intestinal parasites may be zoonotic (able to infect humans). Consult your veterinarian or physician on how to prevent human infection and reinfection of your pet. Drug, Food and Test Interactions Notify your veterinarian of any other medications, including vitamins and supplements, your pet is taking while your pet is receiving milbemycin. No known drug or food interactions. Signs of Toxicity/Overdose Rare. May see any of the above side effects. If you know or suspect your pet has had an overdose, or if you observe any unusual signs, symptoms, or behaviors, contact your veterinarian immediately. Keep this and all other medications out of the reach of children and pets. ** This information may not cover all possible uses, directions, side effects, precautions, allergic reactions, drug interactions, or withdrawal times. Always consult your own veterinarian for specific advice concerning the treatment of your pet.